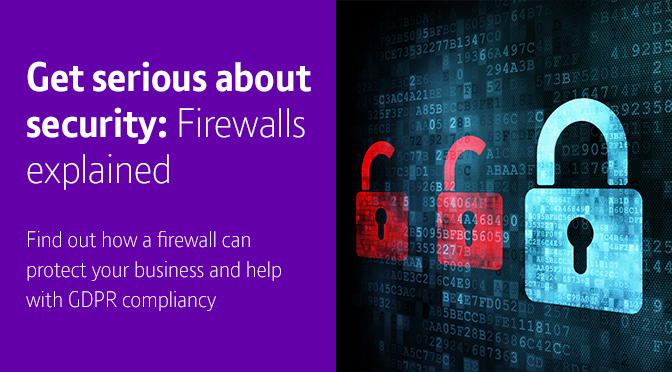 Why is a firewall important for my business? Not many businesses would operate without locks, alarms and CCTV cameras protecting their premises from intrusion and theft. But protecting your computer systems is equally important, to prevent critical business operations being disrupted, or even worse, your private data or intellectual property from being stolen. Security measures are under the spotlight with the upcoming GDPR changes taking effect in May. You need to be able to prove that you’ve taken reasonable steps to protect your customer data in the event of a breach. And a firewall is the cornerstone of any network security strategy. The end of extended support for Windows 7 is less than two years away, so if you’re still running it, perhaps now’s the time to think about upgrading. Moving to Windows 10 Pro on modern devices will give your staff the best possible Windows experience yet – as well as upping the ante when it comes to boosting security. 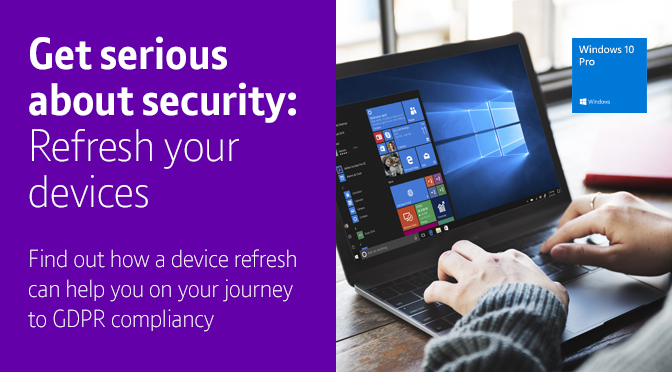 A refresh means your business will profit from all the security benefits that Windows 10 Pro has to offer, as well the additional security features that device manufacturers have built into their modern device ranges. What’s new and improved from Windows 7 to Windows 10 Pro? Windows Hello – With Windows 10 Pro, your staff won’t have to remember passwords – they’re the password. Windows Hello1 is the fastest, most secure way to unlock their new device. It uses their face or fingerprint for authentication, and greets them with a friendly ‘hello’. Plus it works on apps and Microsoft Edge websites. Windows Information Protection – On Windows 10 Pro, you can use Windows Information Protection to control how your staff are using business data. For example, you can stop customer or financial data being copied into social media apps. This means your data is protected, but productivity won’t be affected. BitLocker + BitLocker To Go – Upgrading to Windows 10 Pro gives you peace of mind around security. And a lost or stolen device doesn’t mean you’ll lose your data along with it. BitLocker + BitLocker To Go encrypts data on your device’s hard drive and even on USB drives, protecting your business information. Dell’s Latitude 7000 series is thinner and lighter than ever, with powerful processing to help you take on any task your working day has in store. But advanced data protection and encryption features, Windows 10 Pro OS, and clever authentication options make this range a solid choice when it comes to security too. For more information on how we can help with a device refresh, or with your security strategy, contact our team of IT specialists on 0870 429 3010.